Apple "Spotlight Turns to Notebook" Event - Live Meta Blog Transcript! 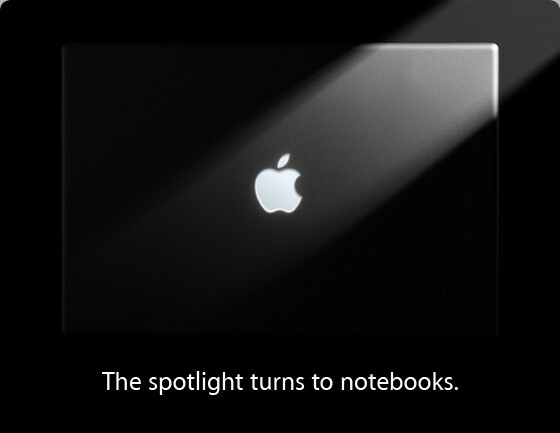 Missed out meta-live blogging of Apple's "Spotlight Turns to Notebook" Event? No problem, we have you covered! Below you'll find the transcript featuring Dieter, Rene, Brian, and special guest Editor Emeritus Mike, as well as all the great comments from our readers. So strap yourselves in. Put your old Macbook on eCraigsBayList (or whatever), and catchup on TiPb's full coverage, after the jump! dieterbohn: Giz says there's around 65 people on-site. How many do you suppose are watching online? [Comment From Yes Sir] Any hope they will introduce 2.2 firmware? Rene Ritchie: Greetings Mobile App-complishers! dieterbohn: ...and or people with iPhones will get a discount on built-in 3G connectivity on AT&T. Probability: 5% at best. [Comment From Wezzy F.] Think there will be a Black Macbook Pro? [Comment From Yes Sir] Nice, anyone here of and what are your thoughts on the "olo-computer"? [Comment From Friday] Think we will be able to walk in and pick up a new Macbook at the Apple Store today? [Comment From Jonishush] Olo-owned? >.> Do you think a new MacBook Pro will be announced, and if so, do you expect a lower price then before? [Comment From BBY (285) Apple Expert] when will the big show start? [Comment From Tom] Doubt i will as its nearly 6pm here in the UK! dieterbohn: We're starting in 15 minutes. Pricedrops -- possible? doubtful? dunno. [Comment From Jonishush] Anything but price-rasing. [Comment From Jonishush] JOBS LOVES KEYNOTES. Rene Ritchie: Figure they'll be for order today-ish, ship whenever they're ready. [Comment From iDave] some say that the lowest priced macbook will be at $899. what do u think? [Comment From Jonishush] Rene, Just would like to thank you, you convinced me to get an iphone over the bold. and I'm glad I did! dieterbohn: Reminder: we won't be able to publish all questions and comments -- need to keep this thing readable as the news starts rolling in! [Comment From Metin] how about throwing in 10 shares of Apple (that you can't sell for 1 year) for everyone who buys a MacBook today? dieterbohn: @metin LOL. the way things are going in the stockmarket, are you sure you'd want that? [Comment From Vincent] when does it start? I'm hoping to pop in and out of here. My day job may beckon. [Comment From Jonishush] Day Job? I took today off for this event! brianhart: @Jonishush You must have a more lenient taskmaster. Rene Ritchie: One more thing rumor was iWork/iLife 09. It's been Smashed. [Comment From deanydeany] What's that in GMT? brianhart: I want a new MacBook Pro (hint hint. early Christmas present from my compadres at TiPb). dieterbohn: the journos are seated! :D Classical Music. [Comment From Dean] Are there a lot of people at the event? Rene Ritchie: Hopefully no iPods = No John Mayer references! Rene Ritchie: Event is taking place at the Cuperino Apple Campus Town Hall very limited seating. brianhart: I had to turn my invite down. Rene Ritchie: I think it was TUAW that said it best: "Apple Stock down after Jobs fails to introduce iUnicorn!" dieterbohn: Ruh roh -- time to turn off cellphones in there. Rene Ritchie: Do we start Pundit Bingo now? How many points for a Mossberg? dieterbohn: It's a tiny stage. [Comment From Jonishush] Steve Jobs is going to take over your minds, Cellphones interfere with the radio waves. Rene Ritchie: Apple stock will fall on almost all news. Only so many iPhone-class bombshells to drop. dieterbohn: The lights dim, we are getting started. Rene Ritchie: Boom time, people! [Comment From iDave] lets all buy Steve Jobs a new shirt shall we? dieterbohn: "Leopard is far ahead of Vista"
Rene Ritchie: Microsoft has already been pre-emptively firing back with "Apple Tax" fud since yesterday. Rene Ritchie: It should make for a lively retort. brianhart: Apple fitting in better than many expected in a Windows environment. dieterbohn: They're really taking it to Vista hard. Rene Ritchie: Apple is acting at the moment, Microsoft reacting. That's a incredible position for the niche player to be in. brianhart: Mac vs. PC adds have been successful. brianhart: "I'm a PC" meh. dieterbohn: Apple says they see a total of 400,000 people in their retail stores every day. [Comment From Jonishush] Apple barely ever bashes Mircosoft compared to what The big M does. I say Fair Game. Rene Ritchie: Little guy can always get away with shots at Goliath. Rene Ritchie: 1 out of every 3 dollars is spent on a Mac. brianhart: I think 150,000 of those daily visitors are at my local Apple store. Rene Ritchie: I use Vista daily. If you can throw hardware at it, it works fine. Microsoft totally messed up on the perception battle, however, and perception really is reality for many people. Rene Ritchie: Steve looks the same as Let's Rock. Let's cut him some health slack, okay blogsphere? brianhart: Stock market pauses to breathe. dieterbohn: B R I C K spells Brick? Rene Ritchie: ZOMG! Jonny Ive on stage? Has that ever happened before? [Comment From Metin] when will Apple merge with Microsoft i wonders? brianhart: or is that his passport photo? [Comment From Vernon] Nice mug shot! [Comment From Vernon] It's going to be so hard not to run out and buy one if they are released today! brianhart: I hope the NEW design = paper close by doesn't ignite. [Comment From bartlewis] anyone notice the stock price as we started? dieterbohn: engadet: "We discovered if we started with a thick piece of aluminum we could make a lighter and stronger part." "So we make it from a solid piece of aluminum." Uh huh... Brickish. dieterbohn: so yes -- definitely looks as though their notebooks' structure is cut from a single piece of aluminum. Rene Ritchie: 2 part chassis, top and bottom, looks like? Rene Ritchie: Back to Steve! Rene Ritchie: Count down to "It's a screamer!" [Comment From mar] anybody notice - Jony Ive is gawjus! brianhart: new graphics card = desktop replacement? dieterbohn: the entire pad IS a button, you turn on multi-buttons via software prefs. dieterbohn: There are new gestures, too. Rene Ritchie: Sweetness is right. Functionality improvement right there. dieterbohn: Glass front, tons of connectors. Rene Ritchie: The leaks were strong with this one. Rene Ritchie: Looks fantastic. Leveraging the iMac design. We really are in the age of "new model year" computing. brianhart: oh man. crap. another high-end purchase to justify to the wife. Rene Ritchie: MacBooks will be lighter? We hopes! brianhart: Unibody design looks gorgeous. dieterbohn: 50% fewer structural parts! Rene Ritchie: "We need them back..." LOL! dieterbohn: either it's that strong or somebody is going to kick sand in his face. Rene Ritchie: Will the regular MacBook get this much love?! [Comment From David] Engadget has the MacBook Pro shell! Rene Ritchie: Everyone's getting a turn with it! dieterbohn: Hundreds of people have worked for many months on this. [Comment From Chris] How long is this event scheduled for? Rene Ritchie: Usually last 1 hr or so. brianhart: you can switch from 9400 to 9600 GT graphics for TURBO! Rene Ritchie: Two graphic options. Rene Ritchie: @Overbo: You and Merlin Mann. Rene Ritchie: Will we get Blu-Ray?! Rene Ritchie: Kevin Rose hopes so! brianhart: The connectors are, in order from the left, Magsafe, Gigabit Ethernet, Firewire 800, two USB ports, a Mini Display Port, Audio In/Out (analog and optical digital), ExpressCard 34, and a battery indicator. dieterbohn: I guess the mini Display Port ain't so bad if it will drive a 30" monitor, eh? Rene Ritchie: Prediction: no "one more thing" It's been fazed out lately. [Comment From David] i miss the excitement of a "one more thing..."
Rene Ritchie: This is all from the 15". Rumor is the 17" is having production problems and will be launched later..
dieterbohn: Once again, the MacBook Pro can power bigger monitors than the iMac can. Rene Ritchie: THEN SO AM I! dieterbohn: .95 inches thick. er. thin! dieterbohn: Time to talk about the Air! brianhart: Which one are you after, Rene? dieterbohn: Air at 1799 / 2499 for 1.86gz + SSD. In early Nov.
Rene Ritchie: @Brian: I'll tell you after they announce them all! dieterbohn: 24 inch Cinema display -- LED backlit! Rene Ritchie: Where are the reg'lar MacBooks? dieterbohn: Comes with a magsafe cable so you can power your laptop with it. cool. Rene Ritchie: LED has significant advantages over LCD. Not OLED sweet, but a big step forward. [Comment From David] I really want them to get round to the MacBooks now! dieterbohn: ONE MORE THING: MacBook! dieterbohn: the return of the one more thing! Rene Ritchie: The man is going to take every last penny I have!!!! Rene Ritchie: Jobs didn't announce availability of the Air or CD did he? Rene Ritchie: So plastic will be the "low price" $999, with aluminum at higher end? Rene Ritchie: @Overbo: Thank you sir! Air in Nov.! brianhart: I gotta bail, guys. Thanks for some great coverage! [Comment From King T] What about the iphone? [Comment From Apogee] wait for the "macbook price point bump"
[Comment From David] $700 more affordable than Pro? Rene Ritchie: @Josh: They're deliberately blurring the lines. [Comment From bartlewis] what does that mean? dieterbohn: reminder: standard plastic macbook not going away yet. dieterbohn: showing a video now. [Comment From bartlewis] The regular MacBook has more than one processor? Rene Ritchie: MacBook has SSD option too?! Rene Ritchie: @Overbo: Which one are you liking? dieterbohn: still showing the video. Rene Ritchie: Engadget: no more matt finish for displays? That deal breaker for anyone? [Comment From palehorse] glossy... outdoors... ummm.. not good. Rene Ritchie: So which MacBook is everyone considering? They really haven't made it easy this time! Rene Ritchie: Will the new trackpad be iPhone buttery? [Comment From Wezzy F.] So if i have a pro now should i go with a new pro or a new macbook? Rene Ritchie: If they unloaded all this right now, what does that leave for Macworld?! Rene Ritchie: They somehow always manage to get the hawt new procs. [Comment From King T] apple put fw on the map, how can it be a pro feature? Rene Ritchie: Must make Michael Dell's shorts itch! Rene Ritchie: Apple Store still down. dieterbohn: Steve: "Blu Ray is just a bag of hurt"
Rene Ritchie: I have legit everything and it still refuses to play at least once a week. dieterbohn: The 17" is also being refreshed today. mmkay, why didn't you mention that before? [Comment From Chris] apple.com updated! Rene Ritchie: Phil: "We have the HD movies and TV on iTunes already". LOL! [Comment From palehorse] what Phil actually meant was "We have the best CONTROL OVER ALL YOUR HD MOVIE AND TV OPTIONS in iTunes.."
Rene Ritchie: Rumor says the new 17" aren't passing QA yet..
Rene Ritchie: Thanks Phil! Now give us a papercut and pour some lemon juice on it! Rene Ritchie: Price drop after early adopters buy.